Kwa Bahal is monastery was built in the 12th century and is a three-storey golden pagoda devoted to Lord Buddha. Fortunately this temple was not destructed by the earthquake. This temple is a true example of courtyard temple architecture. One has to enter the temple through a narrow stone doorway towards the east or through a wooden doorway towards the west. 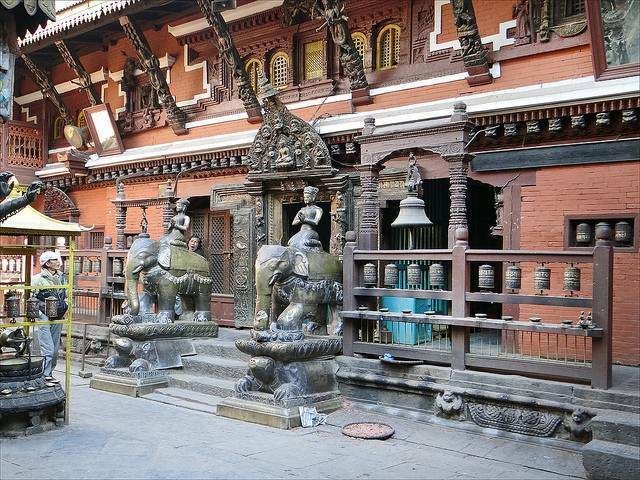 At the front of the each doorway, one can see two elephant statues guarding it. The four corners of the temple’s courtyard have four statues of Lokeshwara. The upper storey of the pagoda has a large prayer wheel and a golden image of Lord Buddha. There is a small shrine facing the temple which has a self-arisen small stupa. The monastery is built with some fine woodcarvings and extravagant works. Except during winters, one can also find several tortoises crawling around the courtyard to guard the temple.